Phil Smith relates how, on 12 August 1944, Flight Sergeant John Lawrie RNZAF crashed and died at the controls of his Lancaster MK. 1 bomber after maintaining control of the damaged aircraft just long enough for his entire crew to bail out to safety over occupied Europe. Are you interested in flying over some of New Zealand's most spectacular scenery in a vintage or classic aircraft? Does owning an historic aircraft for under $10,000 sound attractive? 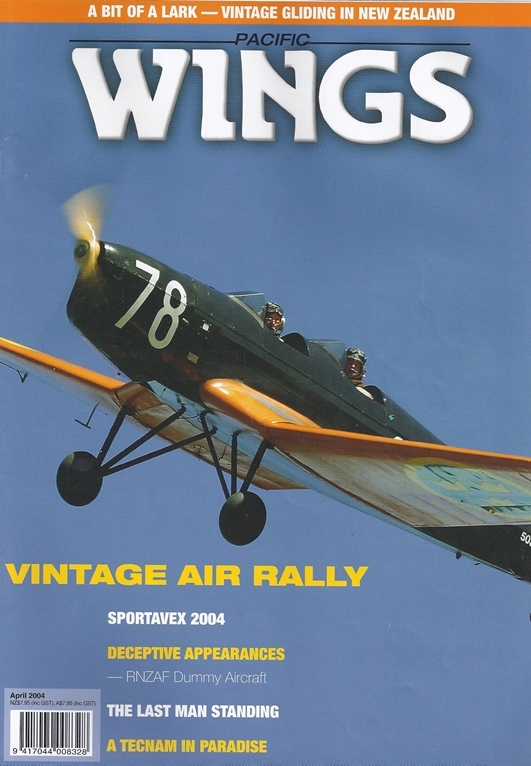 In this article Chris Rudge explores the fun of flying vintage and classic gliders. The biennial showcase for New Zealand's Sport Aircraft Association, SportAvex moved from Matamata to Tauranga in 2004. Clive Wilkinson reports on the weekend's displays. Late February, early March - what better time of the year to enjoy the good weather as you tour around the country in an open cockpit biplane in the company of several dozen other vintage aircraft of varying marks? Well, that was the theory anyway: Sam Higgins reports on an almost water-logged Vintage Air Rally. Additions, deletions and changes of ownership on the New Zealand civil register. By Dave Paul. An elated Steve Walker, president of the Bora Bora Aero Club, describes how affordable aviation arrived in Paradise with the delivery of his club's new Tecnam P96 Golf.